My Fashionable Designs: Free Printable: Trick-or-Treat Scavenger Hunts for Adults & Kids! 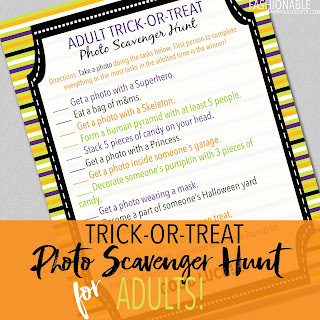 Free Printable: Trick-or-Treat Scavenger Hunts for Adults & Kids! Hi everyone!! 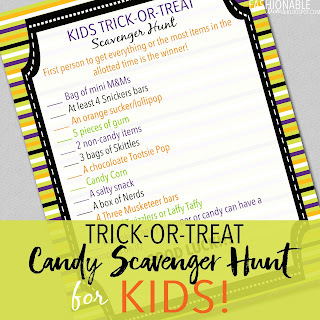 With trick-or-treat just days away, I wanted to share two free printable Scavenger Hunt games with you! Add a little more excitement to the big night!!!! One is a photo scavenger hunt for adults and the other is a candy hunt for the kids. Enjoy! Designed by Jamie/fashionablemoms.blogspot.com for your personal use only.